MILWAUKEE, Wisconsin — Founded in 1989, Milwaukee’s Studio Gear has provided audio, video and lighting equipment rentals, sales and installations to a growing clientele of Fortune 500 companies, houses of worship, universities, small businesses and other customers throughout the Midwest. In fact, for its 25th anniversary Studio Gear is experiencing a growth spurt: “In the past few years we have experienced a huge increase in business, especially for large-scale events,” noted Studio Gear project manager Collin Donohue. As a result, the firm has been steadily expanding its inventory, most recently with the addition of HARMAN Professional’s JBL VTX Series line array loudspeakers and Crown I-Tech HD Series amplifiers. Studio Gear started its JBL inventory with a few VRX900 Series cabinets some years ago, soon increasing its VRX complement more than four-fold. Liking what they heard, the company then purchased a 12-per-side JBL VERTEC® VT4886-based system for larger events. Even so, over the course of the past two years, the need for an even more capable system became apparent—coinciding with the availability of JBL’s current top-of-the-line VTX Series. “The VTX Series’ V20 line array loudspeaker was the perfect fit.” Donohue said. “It sounds spectacular, it can handle a lot of power, delivers exceptionally wide and smooth coverage and its smaller size and weight make it a very good choice for us, especially in situations where height and weight restrictions become an issue. 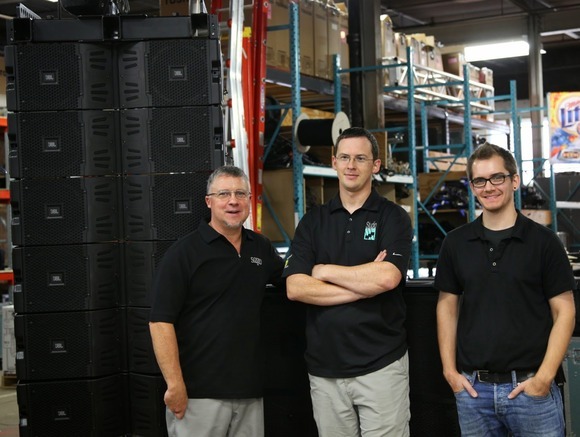 In the corporate production world, that’s a pretty common occurrence.” Studio Gear has purchased 18 V20 loudspeakers to date and also expanded its inventory of VERTEC VT4880A arrayable subwoofers. To drive the V20 arrays, Studio Gear acquired Crown I-Tech 4x3500HD four-channel amplifiers, along with I-Tech 12000HD amps to power the VT4880 subs. “Our first large-scale PA that we ever bought was powered by Crown Macro-Tech amps and as far as big projects go, it’s been all Crown all the time for us,” said Donohue. Donohue and his team are relying more and more on JBL HiQnet Performance Manager™ system setup and calibration software to squeeze every drop of sonic capability from the I-Tech HD Series’ built-in preset tunings and extensive DSP functionality. “The JBL line arrays and Crown amps give us better tools than ever before to deliver a better audio experience to our clients. It’s a tremendous advantage,” Donohue concluded.